A more detailed change log is below, but here are a few highlights and notes before you try it out. The new 64-bit update requires 10.10 or later! 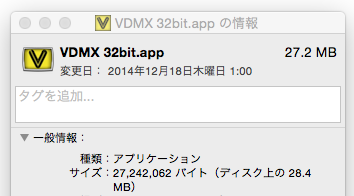 If you'd like to keep this and the older 32-bit versions installed at the same time, simply rename the existing VDMX on your computer to something else (eg VDMX b8232 or VDMX 32bit) before running the new installer. Various old movie codecs are no longer supported by AVFoundation. 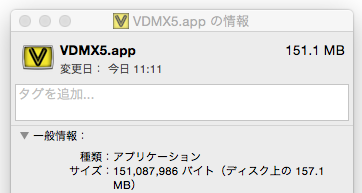 PhotoJPEG, Hap, and h.264 are now generally recommended for use in VDMX. ProRes is also supported. That's right, you can use h.264 movies! To get the best performance while scrubbing / adjusting playback rate make sure to set every frame as a keyframe when encoding. Movie Recorder can capture to h.264 with hardware acceleration on supported GPUs. Recorder can also capture to PhotoJPEG / Hap / ProRes. Vuo support! See the release notes for full details, but essentially Vuo compositions can be used as sources, FX, text sources and plugins. Lots of bug fixes, performance improvements and time saving workflow tweaks.